The idea of mobility looks a little different through the eyes of a soldier. Imagine the daunting challenge of moving 1,100 soldiers more than 500 miles by air and land into a combat zone. Serving in the Iraqi desert helped spark Army veteran Joseph Kopser's idea for mobility app RideScout. The platform allows smartphone users to choose from an array of travel methods -- bikes, car sharing, buses and trains -- from more than 300 mobility providers in 69 cities in the U.S. and Canada. Kopser, RideScout's CEO, co-founded the company in 2011 with Craig Cummings, another Army vet. Daimler AG's mobility division, moovel GmbH, announced its acquisition of RideScout in September. RideScout had its first full-scale city launch in November 2013 in Washington. "Essentially, what we're trying to do is move cities full of people as opposed to moving battalions full of people," said Kopser, 44, who graduated from West Point in 1993 with an aerospace engineering degree. 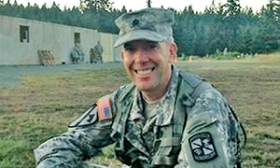 Kopser worked in a supervisory role while in Iraq, dealing with issues including personnel, intelligence, operations, communications and maintenance. That experience taught Kopser lessons in team-building and problem-solving that served him well as an entrepreneur. "Because of a couple of trips through combat, I manage not to sweat the small stuff," Kopser said. "Because once you've been shot at, you don't worry too much about whether or not a PowerPoint slide is perfectly centered." Kopser said he wanted to give the public a host of mobility options to cut American dependence on foreign oil after seeing soldiers have to defend Iraqi oil pipelines, fields and refineries. Some of that oil, he said, likely ended up in the U.S. in cars that were stuck in traffic -- a thought that didn't sit well with him. The mobility world, Kopser said, is chaotic at the moment with so many developments taking place. That chaos is nothing new for a soldier. "The disruption that's occurring at record speed, there are all kinds of new precedents, all kinds of new resources," Kopser said. "It very much feels like the chaotic life of a deployed soldier having to go into a community and try to apply the resources we have to keep it safe, keep it secure and make it a better quality of life for people."